Proteolysis is one of the posttranslational modifications of the six IGFBP´s. It results in fragments with no or reduced affinity to IGF-I and IGF-II and results in increased availability to target cells (2). The fragments obtained by proteolysis may also have IGF-independent functions (1). IGFBP-3 proteolytic activities have initially been found in pregnancy serum. Later fragments have been detected in other body fluids (1). Increased proteolysis has been observed in malignancies, as e.g. breast cancer (3) and leukemia (7), in malnourished elderly people (4), in insulin dependent diabetes mellitus (5) and after extensive exercise (6). The assay results are not affected by intrinsic IGFBP-3 or free IGF´s in the samples. Though in our experiments with Plasmin we found, that the biotinylated IGFBP-3 is degraded somewhat slower than the non-biotinylated form (see Application Note IGF018) we could show, that the fragment pattern obtained is equivalent to the fragment pattern obtained with non-biotinylated IGFBP-3. Therfore the IGFBP-3 Direct Proteolysis Assay Kit is recommended for use as a rapid and very sensitive screening test in samples which may contain intrinsic IGFBP-3 and for comparison of protease activities e.g. in normal and disease state samples. The test uses biotinylated IGFBP-3 as a substrate for proteases. The proteolysed Biotin-IGFBP-3 is bound to the wells of a Streptavidin coated microtiterplate. Unproteolysed IGFBP-3 is detected by a monoclonal antibody to human IGFBP-3 followed by a goat-anti-mouse-peroxidase-conjugate. 5. Assay Buffer, buffered solution for dilution of proteolyzed samples and Conjugate. 50 ml. Ready for-use. 8. Stop Solution, 0,2 M sulfuric acid11 ml. Ready for use. Caution: caustic. The ibt direct IGFBP-3 proteolysis assay kit is for in-vitro use only! 7.1.2 Dissolve BiotinIGFBP-3 with 100 µl distilled or demineralized water to yield a 25 µg/ml solution. Mix carefully and allow keep at room temperature for at least 30 minutes to ensure complete dissolution. The Biotin-IGFBP-3 is stable for one week at 4 °C. Reconstituted Biotin-IGFBP-3 may be frozen in aliquots and is stable for at least one month. 7.1.3 Reconstitute the Antibody with 50 µl of distilled or demineralized water to yield a 1 mg/ml stock solution. The stock solution is stable for at least one month at 4°C. Prepare the required quantity of working solution by dilution of 1 volume of the stock solution with 2000 volumes of Assay Buffer, e.g. 1 µl antibody to 2 ml Assay Buffer. 7.1.4 Prepare the required amount of washing buffer by dilution of 1 volume of the concentrated washing buffer with 9 volumes of distilled or demineralized water. Use within one week. 7.1.5. Prepare the required amount of conjugate working solution by dilution of 1 volume of the concentrated Conjugate with 2000 volumes of assay buffer (e.g. 2 µl Conjugate plus 2 ml assay buffer. Proteolyse suitable aliquots of biotinylated IGFBP-3. After proteolysis stop reaction with suitable protease inhibitors. Dilute samples to fit into the standard curve. Please note: The proteolysis of IGFBP-3 may beaffected by IGF´s. There are differences in proteolysis of glycosylated and non-glycosylated IGFBP-3 as it is used commonly in the assays with I125-IGFBP-3 (10). As an example we have tested degradation of biotinylated IGFBP-3 with plasmin using the conditions described in a paper by Vorwerk et al. (13). 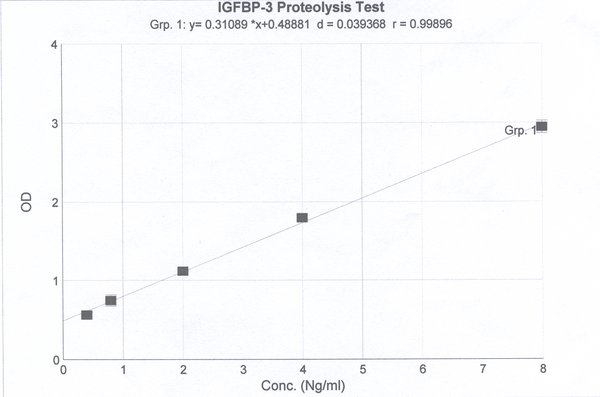 For proteolysis, we incubated 0.5 µg of biotinylated IGFBP-3 with 10 µg, 5 µg, 1.25 µg 0.25 mg and 0 mg (as control) in a total volume of 40 µl Tris-HCl pH 7.5 for 30 min at 37 °C. The reaction was stopped adding 10 µl of a stock solution of a protease inhibitor cocktail (1 Complete Mini tablet, Roche Applied Science, in 1.5 ml water). An aliquot was diluted to 10 ng/ml and the concentrations of the nondigested IGFBP-3 was measured. The concentrations of the plasmin digested samples are found in the range of 4.54 ng/ml to 7.71 ng/ml, corresponding to a degradation of biotinylated IGFBP-3 from 54.6 to 22.9 %. The concentration in the control was calculated as 10.29 ng/ml, corresponding to a recovery rate of 102.9 %. In another experiment we measured IGFP-3 in different cancer sera compared to a normal serum as a control. 50 µl of a 1 µg/ml solution of biotinylated IGFBP-3 in assay buffer were mixed with 50 µl of normal serum or cancer serum and incubated over night (18 h) at 37 °C. The reaction was stopped with 25 µl of a stock solution of a protease inhibitor cocktail (1 Complete Mini tablet, Roche Applied Science, in 1.5 ml water). The concentrations of undigested biotinylated IGFBP-3 have been measured in a diluted sample. In some of the cancer samples we observed strongly increased IGFBP-3 proteolysis. As the samples of cancer serum have been form a commercial source, no detailed clincial information on disease stage etc. was available and the number of samples was limited. Therefore no interpretation of the significance of increased IGFBP-3 proteolysis for the disease is possible. However the usefulness of the Direct IGFBP-3 Proteolysis Assay kit as a screening assay in complex samples of biological origin has been demonstrated. 7) Insulin-like Growth Factor Binding Protein (IGFBP)-3 Protease Activity Secreted by MCF-7 Breast Cancer Cells: Inhibition by IGFs Does Not Require IGF-IGFBP Interaction. Salahifar et al. Endocrinology Vol. 138, No. 4 1683-1690.